Here are 7 tips on how to improve site-search on your eCommerce website. While basic and obvious, it’s amazing how many sites don’t have any search on their web or mobile sites. So, for your users’ sake – if you don’t have search for your site – get one. What’s worse: not having a site search at all or making your search-box utterly invisible? Often, due to page design or theme considerations, search becomes a small magnifying glass icon that is hardly noticeable to the eye. Again, if you don’t show them where it is – they won’t use it. Put yourself in your site user’s shoes and try to find something on your site. Or even better, have someone else try to find something on your site, and watch how she fumbles. Make your search visible so that people can use it. Ever since Google started with auto-completion or auto-suggest a few years ago – without even knowing it, users have become addicted. When you start typing anything within a Google search box, you would immediately see a drop down box with at least four suggestive search queries. It’s extremely fast, and amazingly accurate in predicting what it is that you would like to search. I recommend using both product and search query suggestions, as they increase the likelihood of user selection and accelerate conversion. Your users are using Google and Amazon. They are conditioned to expect auto-completion. If your site search engine has a decent auto-completion module – have it enabled. If you don’t have one, get an auto-complete product and install it, or subscribe to a good search auto-complete service. A picture is worth a thousand words. There is plenty of research in advertising on how an image and its placement on a page increases the likelihood of clicking an ad. Similarly in search, images are very powerful. Make sure that your product images appear in your search results page. 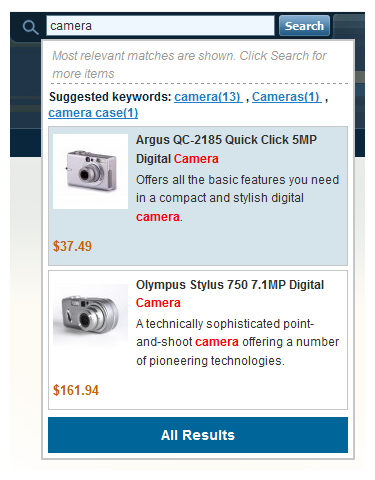 If you are using auto-completion – make sure that suggestions include image thumbs for each product. Which of the following two examples is more appealing? “You can’t manage what you can’t measure” the saying goes. Well, search is highly measurable. Most search engines, or hosted searches keep a list of search terms (search term is the professional name for what people are typing). For example, Google’s Keyword Tool allows you to see search volume for specific keywords and related keywords. Many hosted search services also offer a search log or dashboard that display similar results. 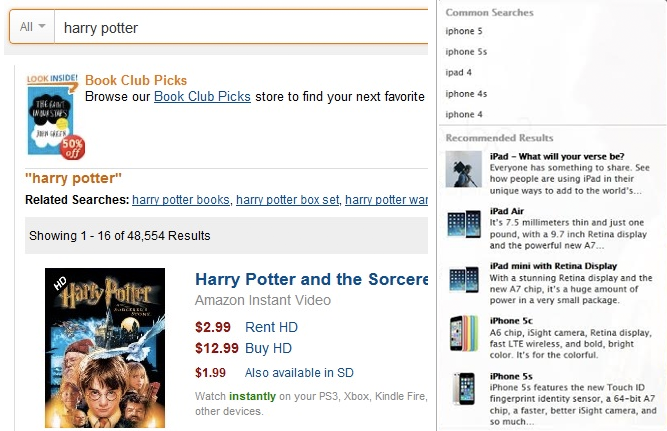 Getting back to the first question of the post: Ever wondered why the first result you get when you type “Harry Potter” on Amazon – is an Amazon instant video? Behind the scenes, there’s a sophisticated system that optimizes search results and product suggestions to what users are looking for. ← Why a WordPress Website is Better than a Traditional Website for Your Business?